The Christkind (German "Christ-child", pronounced [ˈkʁɪstkɪnt]) is the traditional Christmas gift-bringer in Austria, Switzerland, Germany, the Czech Republic, Croatia, Italy (however only the South Tirol area), Liechtenstein, Luxembourg, Portugal, Slovakia, Hungary, parts of northeastern France, Upper Silesia in Poland, parts of Hispanic America, in certain areas of southern Brazil and in the Acadiana region of Louisiana. In Italian, it is called Gesù Bambino, in Portuguese Menino Jesus ("Jesus Boy"), in Hungarian Jézuska ("Little Jesus"), in Slovak Ježiško ("Little Jesus"), in Czech Ježíšek ("Little Jesus"), in Latin America "Niño Dios" ("God Child") or "Niño Jesús" ("Jesus Child") and in Croatian Isusić or Isusek ("Little Jesus"). Promulgated by Martin Luther, explicitly to discourage the figure of St. Nicholas, at the Protestant Reformation in 16th–17th-century Europe, many Protestants changed the gift bringer to the Christ Child or Christkindl, and the date of giving gifts changed from December 6 to Christmas Eve. A gift-bringer familiar to children in Central Europe, the Christkind bears little resemblance to the infant of Bethlehem. The Christkind was adopted in Catholic areas during the 19th century, while it began to be gradually replaced by a more or less secularized version of Saint Nicholas, the Weihnachtsmann (Father Christmas, Santa Claus) in Protestant regions. 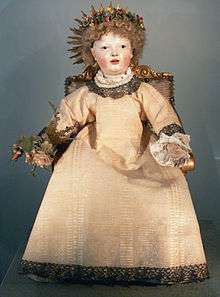 The Christkind is a sprite-like child, usually depicted with blond hair and angelic wings. Martin Luther intended it to be a reference to the incarnation of Jesus as an infant. Sometimes the Christ Child is, instead of the infant Jesus, interpreted as a specific angel bringing the presents, as it appears in some processions together with an image of little Jesus Christ. Children never see the Christkind in person, and parents tell them that Christkind will not come and bring presents if they are curious and try to spot it. The family enters the living room, where the Christmas tree has been put up, for the opening of presents (the Bescherung) when the parents say that they think that the Christkind who has brought the presents has now left again. In some traditions, the departure is announced by the ringing of a small bell, which the parents pretend to have heard or which is secretly done by one of the adults in the family. Since the 1990s, the Christkind is facing increasing competition from the Weihnachtsmann in the American version of Santa Claus, caused by the use of Santa Claus as an advertising figure. Christkindl or Christkindel are diminutive versions of Christkind. Christkind and Belsnickel are also found among communities of Volga German descent in Argentina. A well-known figure is the Christkind at the Christkindlesmarkt in Nuremberg, which is represented by a young woman chosen every year for this task. Christkindl is also a part of the city of Steyr in Austria, named after the allegedly miraculous wax statue of Christkind in the town church. Landler, Mark (12 December 2002). "Vienna Journal; For Austrians, Ho-Ho-Ho Is No Laughing Matter". The New York Times. Retrieved 10 December 2009. Cain, Phil (December 14, 2009). "Austria campaign to save Christkind from Santa Claus". BBC News. Retrieved December 14, 2009.